Yay! 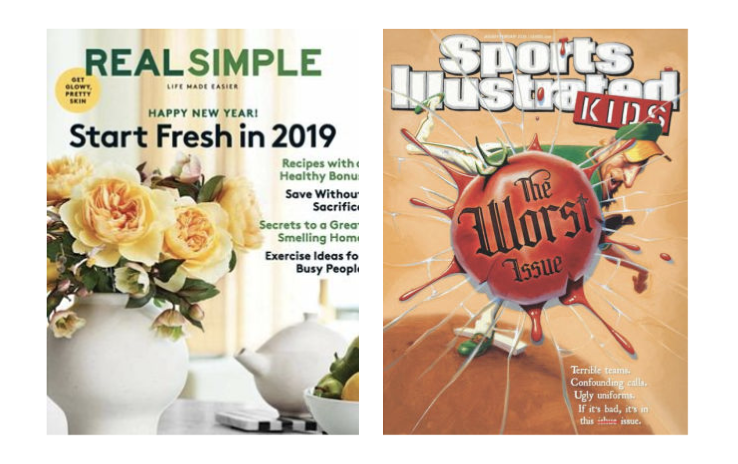 This super popular deal on a free subscription to Real Simple magazine has finally returned, plus you can get a free Sports Illustrated subscription, too! I took a short survey that they offered me (it only took me about two minutes). As soon as I took the survey, they offered me $30 in free rewards points that I could spend on a number of different magazine subscriptions. I chose to get Real Simple magazine. You just fill out a simple form and check no on the offers that pop up. After I had ordered my subscription to Real Simple magazine — completely FREE! — I was offered the option to take another survey. So I said yes. I took the second survey (again it only took me less than 2 minutes) and I was offered more magazines I could order for free. I chose to get Sports Illustrated for Kids. Again, I checked “no” on the extra offers and got the free subscription. Note: I didn’t have to give any card information, so I won’t be billed ever nor will my subscription auto-renew. Go sign up and get your free subscriptions! And let me know which magazine subscription(s) you choose! I can’t wait to get my FREE magazines in the mail… and Silas is going to be excited about getting Sports Illustrated for Kids! Thank you! I always get these for the residents at our nursing home. I just send them to my address and hand them directly to a resident I think might be interested in it when I go to work. Afterwards they put them on the table for others to look at. I’ve been getting points with rewards survey for quite a while. At one time I had over $600 worth of credits in my account. I’ve gotten all the Mags I want and so I have sent subscriptions to many others. Its a great deal. And as you said, no credit info required so no charges or auto-renew! I love the idea of sending mags to others, too! and YAY for $600! That’s amazing!!! I was able to order a $30 magazine too. Got another offer to get another free $30 so I did so. Then if I wanted to go any further, I had to take advantage of a $2 offer for 1 to 5 mags. I did not want to provide my credit card info, so I clicked CONTINUE and was sent back to the page that said TAKE ADV OF THIS $2 OFFER AND GET ANOTHER $30 FREE. I tried 2 or 3 times to get past the $2 offer but failed. I did note that after I logged out and then logged in, there’s no MY ACCOUNT option. I cannot see any ORDER HISTORY or the like. I do not know for sure if my two $30 magazine gift was actually received. But since I never had to divulge any credit card info, I’m find that I only gave my name/address. I was able to just click the X button on that offer and it went away. I’m sorry that you weren’t able to click out of it. Buy YAY for free magazines! I got the same $2 offer and request for credit card info. There is an X in the upper right-hand corner that will close that offer and goes to a confirmation page. Thanks Crystal…got my free mags too!! Thank you!! I was able to get SI for kids and I will donate it to our school’s library. The kids love to read magazines just as much as books. I love Real Simple but am cutting back on all mag subscriptions as I’m taking control of my spending; to get this free is such a bonus! Thank you for keeping an eye out on great deals. I’m glad you were able to get in on this deal! FREE is my favorite price! When I do this, it wants to charge me 0.99 for RealSimple. Some of them are free, like the Kid’s Sports Illustrated, but Real Simple is one of the 0.99 ones and it wants me to give them my card info. Also, I used 10 of my credits for ABC mouse for my kids, but that was literally just a link to their free trial, which you could have gotten without ever doing a survey. Yes, unfortunately, Real Simple is not currently free. They change their offers fairly often! Tried to order the Real Simple magazine after completing the survey and receiving the credits. I was not able to go any further without proving my credit card information. Waste of time. Yes, like I mentioned in the post, this is currently not available for free. It’s $0.99. Hopefully it will be free again soon!